Wii U, Nintendo 3DS, and PC owners have had the privilege of playing Yacht Club Games' Shovel Knight for a little less than a year now. As of a week ago, PlayStation platform owners have been able to sink their collective teeth into the game and see what all the hype has been about. The wait hasn't been for naught, however, as cross-play, cross-buy, and the addition of a Kratos (from God of War fame) boss fight are included in the digital package, meaning whichever PlayStation device you play Shovel Knight on, you're bound to have a blast. 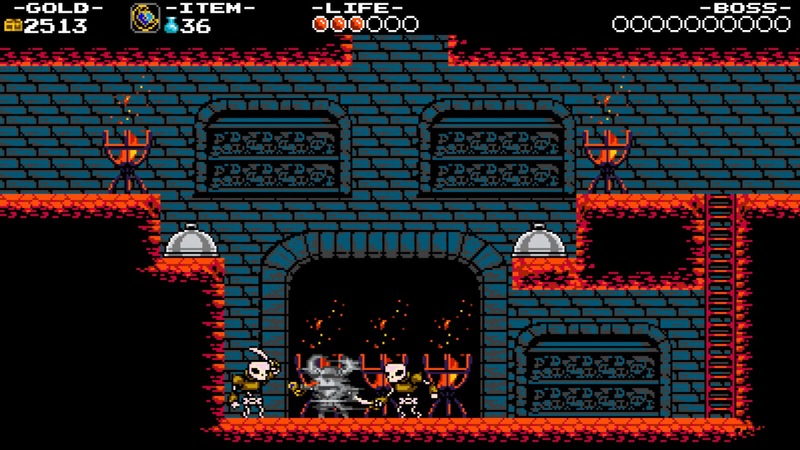 The duo of Shovel Knight and Shield Knight had battled inside the Tower of Fate. However, the evil energy that exuded inside the tower made the pair weak, putting both unconscious. When Shovel Knight awoke, he discovered his dear friend Shield Knight had been sealed in the tower. Grieving, Shovel Knight went to a quiet, isolate life in seclusion. 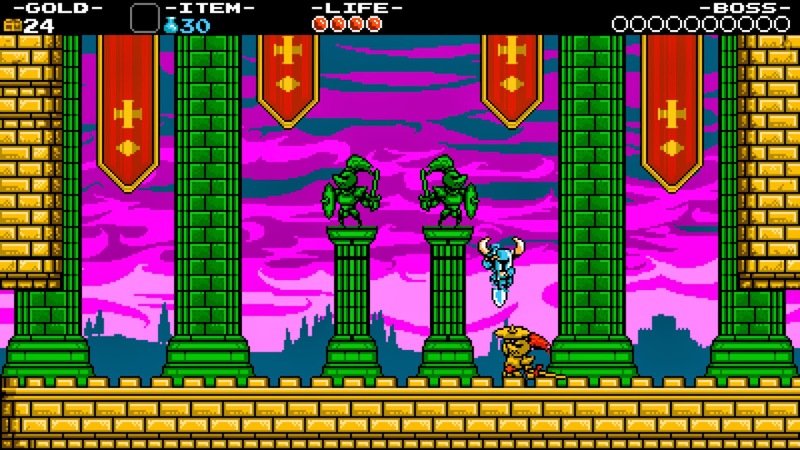 During this time, the Enchantress, a diabolical villain, entered into the fray, causing mayhem across Shovel Knight's world, and opening the Tower of Fate in the process. With the tower now open, Shovel Knight returns to battle, ever ready to rescue his beloved Shield Knight. 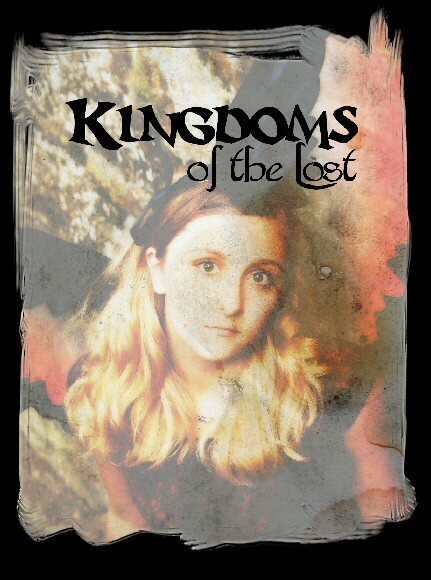 The game features well done dialogue and a story that winds up unsuspectingly touching at its conclusion. Shovel Knight as a game itself is a love letter to the 8-bit era of gaming, most notably the NES days, a simpler time in gaming, where difficult (aka "Nintendo hard") games prevailed. Shovel Knight could very well be a product of that time period with its lovely 8-bit visuals, although with its modern touch, there is no battling with screen flickering or undesired slowdown in the frame-rate. Imagine a cavalcade of parts of NES favorites mixed in a blender to create one satisfying product. That is what essentially Shovel Knight is. It has the level progression Mega Man games, the world map of Super Mario Bros. 3, the bouncing off heads with an elongated weapon a la DuckTales, and the 2D towns and NPCs of Zelda II. It's a marriage of gameplay styles that works wonderfully. For instance, there are eight boss stages spread out across the world map, each with its own locale and set of obstacles and level gimmicks to them. From Mole Knight's volcanic caverns to Plague Knight's haunted graveyard, where the lightning reveals the elements of the level such as platforms, Shovel Knight very much feels like Mega Man in level flow. Shovel Knight really digs treasure, and I mean that in a figurative and literal sense. From defeated enemies and mounds of dirt, Shovel Knight obtains jewels, gems and gold that's used to purchase a number of things, such as relics that bestow helpful abilities to S.K., new armor, new shovel upgrades, and the option of increasing his maximum health and magic. While Shovel Knight indeed feels very much like an old school NES game in its difficulty, how the game handles death is much different from its 8-bit inspirations of the past. 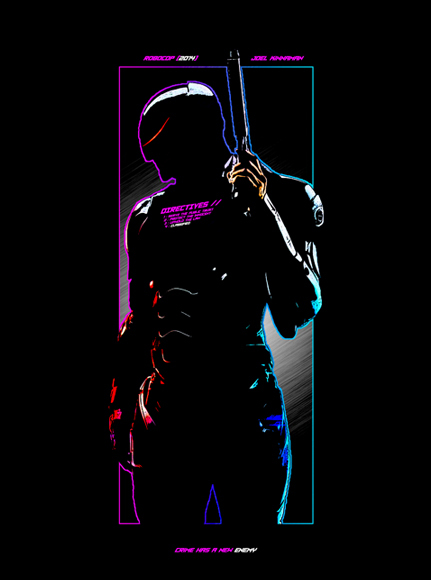 For one, a lives system is not in place, so therefore, there is also no "game over" screen to speak of. Instead, when Shovel Knight loses all of his health or falls into a pit, he loses some of his riches. These lost riches appear at the location he died at, ready for players to attempt to pick them back up once they return to the point of death. Checkpoints are in the form of lanterns that light when passed by. When Shovel Knight dies, he is taken back to the last checkpoint left standing. I say "left standing" because one of the feats in the game to complete is to beat a level by destroying every checkpoint. What are feats, you ask? Feats are essentially achievements that players can go after to add even more longevity to Shovel Knight. These feats task players with goals such as beating the game in under 90 minutes, beating a boss without taking damage, using a relic in a certain way, and so forth. Only a true masochist-- I mean, pro at the game, will have the courage, ability and skill required to complete all of the feats in the game. 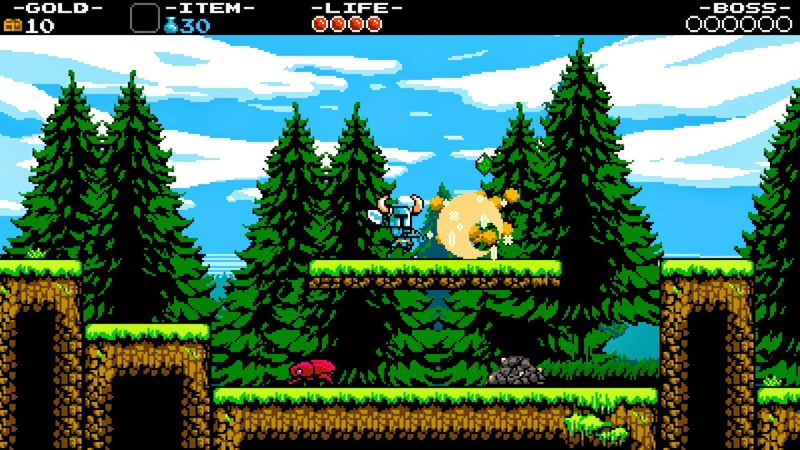 Shovel Knight doesn't try to push the envelope forward, as it's an homage to 8-bit platformers of the past. It succeeds in not only being a solid homage, but also being a class act of a game from beginning to end. By no means is it for everyone, as the difficulty of the game can be quite challenging, especially if you don't look (or shovel) before you leap. 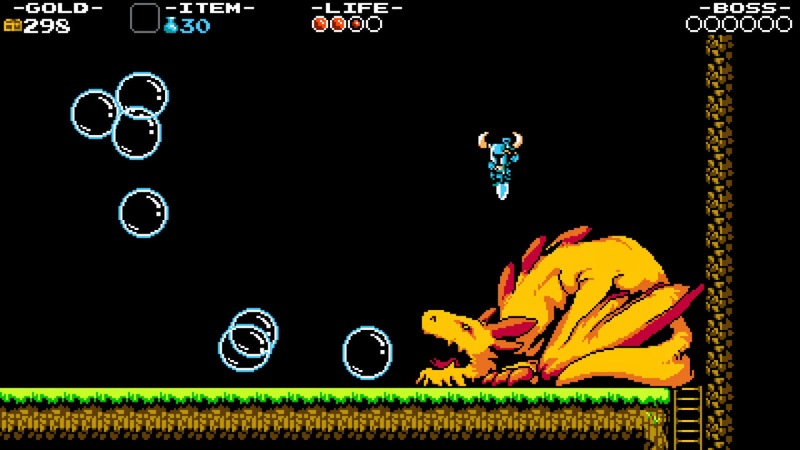 However, with a load of feats to complete, tight and responsive controls, miniature levels to take on that feature use of a specific relic in Shovel Knight's arsenal, and plenty of replay value despite its brief amount of hours to beat, Shovel Knight surely digs upon solid ground and a solid 2D platforming foundation. See exactly why Wii U, Nintendo 3DS, and Steam players have been shouting Shovel Knight's name with glee for nearly a year now.